Applebee’s serves a range of entrees, soups, sandwiches and salads. The Grilled Chicken Caesar Salad can be a good source of lean protein from Applebee’s, but make sure you know the full nutrition information before you order because it might be different than you expected. The nutrition information is for a Regular Grilled Chicken Caesar Salad that has romaine lettuce, grilled chicken breast, Caesar dressing, croutons and Parmesan cheese. 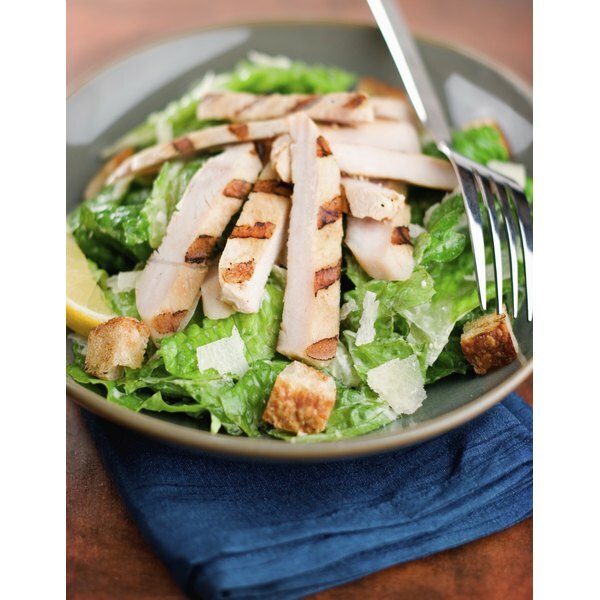 The Grilled Chicken Caesar Salad has 820 calories and 57 grams of total fat with 11g saturated fat, which increases blood levels of bad low-density lipoprotein, or LDL, cholesterol. The salad has 25 g carbohydrates and 54 g protein. If you get a half portion of the salad, you will get half the amount of calories and other nutrients as the full order. You can also choose the full-sized salad without dressing, which has 370 calories, 10 g fat and 3.5 g saturated fat. MayoClinic.com states that sodium is an essential component of your diet because it regulates fluid balance, and your muscles need sodium to function properly. However, most Americans get more sodium than they need, which puts them at risk for high blood pressure and stroke. Healthy adults should not get more than 2,300 milligrams of sodium per day, while people with hypertension should not have more than 1,500 mg sodium per day. The Grilled Chicken Caesar Salad from Applebee’s has 1,640 mg sodium. If you skip the dressing, the salad has 900 mg sodium. The 2005 Dietary Guidelines from the U.S. Department of Health and Human Services note that the total number of calories that you eat and use determine whether you lose weight. However, staying within the Acceptable Macronutrient Distribution Range of 10 to 25 percent of your total calories from protein can help you control your calories and lose weight. For someone on a 2,000-calorie diet, this would mean eating 50 to 125 g of protein per day. The Grilled Chicken Caesar Salad from Applebee’s has 54 g protein. If you do not get enough fiber from your diet, you may have a higher risk for constipation and heart disease. MayoClinic.com also states that dietary fiber may lower your cholesterol levels. Sources of fiber are plant foods such as many kinds of fruits, legumes such as beans and peas, whole grains and vegetables. Applebee’s Grilled Chicken Caesar Salad has 7 g dietary fiber, or about 28 percent of the daily value for someone on a 2,000-calorie diet. If you are concerned about your calories, Applebee’s recommends choosing an item from its Unbelievably Great Tasting and Under 550 Calories Menu. You can get a similar amount of protein and fiber from the Asian Crunch Salad as from the Grilled Chicken Caesar Salad, but the Asian Crunch Salad only has 490 calories and 9 g fat with 1 g saturated fat. Be careful if you are watching your sodium intake since the Asian Crunch Salad has 3,170 mg sodium, or nearly twice as much sodium as the Grilled Chicken Caesar Salad. What Are the Health Benefits of Napa Cabbage Salad?